Preheat oven to 325 degrees F. Place 24 paper baking cups into muffin pans. Put the cookies into a food processor & pulse until you end up with coarse crumbs. Stir in the butter until it is fully incorporated into the crumbs. Place a Tblsp of the cookie mixture into each paper cup & press firmly into the bottom. Chill until set. In a large bowl, beat the ricotta until smooth. Add the cream cheese, vanilla & confectioner's sugar, blending until smooth. Slowly add the eggs, blending well. Spoon mixture evenly over crust. Bake for 25-30 minutes. Remove pan from oven & cool 5 minutes. 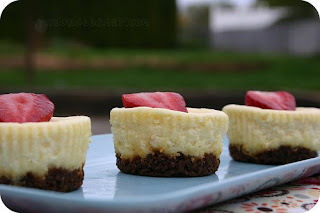 Then remove the cheesecakes & cool on a wire rack. Remove paper liners. Chill until ready to serve. Top with sliced strawberries. The Best Chocolate Sheet Cake Cupcakes. Ever.